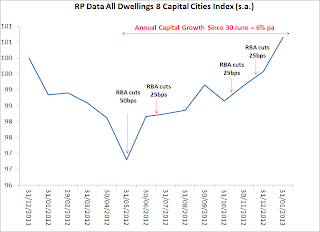 A friend kindly pointed out that I had said on 25 January 2012 that "If the RBA cuts again in February [they did not], and further thereafter [they started in May and June], as some analysts believe they will, expect to see the return of rapid house price appreciation." 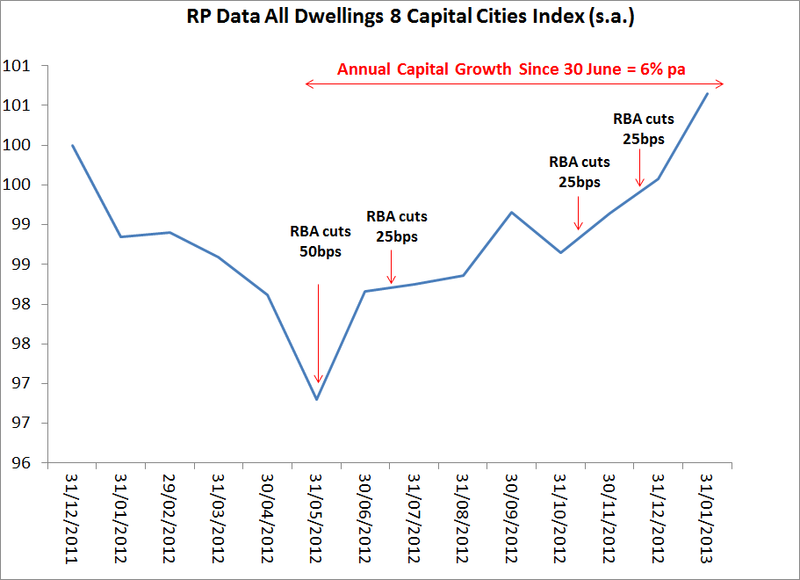 Here is what happened to national home values since the RBA started cutting rates in 2012...I am not sure if everyone agrees 6% pa house price growth, which is well above wages growth, is "rapid". It is certainly not slow, and much stronger than my through-the-cycle forecast of 4-5% pa...Read more here. This is an exception, but you can read my long feature story on David Irvine, ASIO, ASIS, DSD, Stuxnet, Flame, MiniFlame, Gauss, Duqu, the NSA and cyber-warfare over at the AFR for free now here. As per my comments below, all my posts are going to my AFR blog now. You can access it for free here. I have some ideas on the future of super, and how to go about selecting fund managers. You can read them over at the AFR here. Actually, I flagged this weeks ago after the soft wages data. But you can read my AFR column on the RBA's December board meeting over at the AFR here. 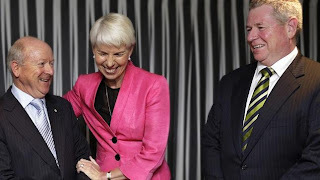 (1) The price of bank safety and (2) Who will succeed RBA's Stevens and APRA's Laker? Investors expect a trade-off between risk and return, but in Australian banking this relationship is inverted – banks with the lowest risks provide the highest returns. Taxpayer subsidies probably explain why. The two most obvious and apolitical successors to Stevens and Laker are, respectively, the RBA’s Dr Phillip Lowe and Dr Guy Debelle. Both have PhDs from MIT and are experts in monetary policy and financial stability. Dr Lowe is currently deputy governor and widely considered a natural replacement to Stevens. Dr Debelle runs the RBA’s financial markets division and led the central bank’s efforts to keep banks solvent during the global credit crisis. In the Weekend AFR I have a page one, exclusive news story entitled, “RBA governor mulling retirement”. You can read it here. I also have my standard Saturday column, “Housing gain, retiree pain via cheap money”, covering the RBA’s December board meeting and what it means for housing, cash, floating-rate bonds, fixed-rate bonds, and equities. You can read my opinion piece here. The AFR has massively boosted its content in the last year or so under the leadership of Brett Clegg and Michael Stutchbury. You can access the entire newspaper and the many magazines/lift-outs online or via an iPad for circa $1.90 a day here. IF the value of your total assets fell by 6 per cent would you be insolvent? If you are sensible, probably not. Big companies like Woolworths or BHP would have to endure a drop in their assets of at least 40 per cent before their assets were worth less than their liabilities. Yet the four major banks would be. If National Australia Bank's total assets, for instance, fell in value by 6 per cent to $717 billion, its capital or shareholders' funds would be more than wiped out. RBA governor Glenn Stevens and Financial Services Minister Bill Shorten have both thrown “knuckle-balls” into the evolving policy debates on how to prevent banks and non-banks from collapsing. Stevens also revealed he’s taken a directional punt on the Aussie dollar. No surprise: Aussie growth expected to be "above trend"
The annualised growth rate of the Westpac–Melbourne Institute Leading Index, which indicates the likely pace of economic activity three to nine months into the future, was 4.1% in September 2012, above its long term trend of 2.8%...This is the second consecutive month that growth in the Index has been above trend with August and September the only months since August last year that above trend growth rates have been recorded. Westpac is a little less optimistic than the Index at this stage with our expectation that growth in the second half of 2012 will be around 2.5%, slightly below trend. Read my AFR column in reaction to the IMF news on the Aussie dollar today here (free). Banking Day: HSBC has confirmed it is in talks to sell its US$9.3 billion (A$9.0 billion) stake in China's Ping An Insurance, as it continues to shed non-core businesses and rebuild its profitability. In a statement to the Hong Kong Stock Exchange yesterday, HSBC said the talks might not result in a sale of the 15.6 per cent stake, however. On Monday, the Hong Kong Economic Journal reported that Dhanin Chearavanont, Thailand's richest man, might buy the shares.